I’m not sure how I’ve made it through my daughters’ elementary school years without one class play. Sure, I’ve pulled together costumes for Bug Day (second grade), Colonial Day (fourth grade), and Greek Myth Day (sixth grade), but never a class play. Is it just my school or is the country losing this tradition of homemade costumes, adoring parents, and uncomfortable children? The kids take us through the time after the Revolutionary War, when America had won its freedom but had yet to become a country. With all the states having separate governments and leaders, they needed to find a way to resolve conflicts between them and make decisions as a nation. Through a narrator’s text and dialogue from the “states” and “statesmen,” the reader learns about the process of forming our government. An afterword and notes section answer additional questions. The cartoons by Jef Czekaj will feel familiar to kids, and keep the illustration fun. I do think that the illustrations could have gone funnier and taken better advantage of the performance aspect  I wanted to see the kid who holds his sign upside down or who knocks over the scenery. Maybe next time. The book’s style makes a complicated topic more accessible and enjoyable. It’s perfect for classroom use and covers a subject that all American kids will study, even if they don’t have their own class play. Nonfiction Monday is hosted today at Books Together. It's true there are more Days than Plays (this year was Biography Day)...why? Lower expectations? Schools wanting to make more of every precious learning moment? Our best costume to date was a harpy eagle head-dress (Rainforest Day). This year's Alexander the Great costume was uninspired. But perhaps we can make up for it next year, when Our Boy is part of the Wax Museum of famous Latin Americans. Glad you liked it, MR! This is one of my babies. Did you miss the backwards E on the full title page (with my most favorite stage direction: "poke poke" from behind the curtain with the broomstick)? 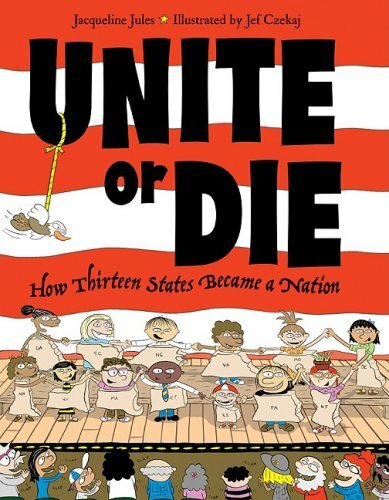 Thanks so much for the thoughtful and entertaining review of Unite or Die. I loved your comments about "the traditions" of school plays. Charlotte, your last sentence leaves me questioning - though I suppose my Bug Day could raise some eyebrows too. J.J., my pleasure to review your book. My daughter is in the midst of her Revolutionary War study now so we're going to share it with her class. Sounds like a good book. I am always on the look out for books about US history that help teach it to kids. My daughter is not in school yet so no experience with school plays, and costumes are just for Halloween. When I was teaching I did puppet shows -- so much less discomfort all 'round, behind the curtains, letting painted faces talk!